The New Development Bank (NDB) and the Food and Agriculture Organization of the United Nations (FAO) co-hosted a workshop on Development Impact and the Sustainable Development Goals (SDGs) focused on the sectors of Irrigation, Water Resource Management & Water, Sanitation and Hygiene (WASH) on 20-21 February 2019 in Shanghai. In the spirit of SDG 17, the workshop sought to share technical knowledge among a range of development actors on how to better integrate the SDGs into the design and implementation of infrastructure and sustainable development projects related to water. Among the participants were government representatives from BRICS countries, specialized United Nations (UN) Agencies and programmes (FAO, UNDP, UN-Water), multilateral development banks (ADB, AIIB, NDB) and national financial institutions (BNDES, CDB, DBSA), in addition to think-tanks and sector experts (Bill & Melinda Gates Foundation, IMWI). The discussions revealed different perspectives on how to address water challenges and deliver interventions that go beyond business-as-usual. A key takeaway from the workshop was that promoting a better understanding of the roles, approaches, and experience of different development actors will be essential for delivering projects that can advance efforts to help achieve the objectives of SDG 6, SDG 17 and the wider 2030 Agenda. The participants agreed to build on the outcome of the workshop through ongoing engagements to foster deeper technical exchanges. 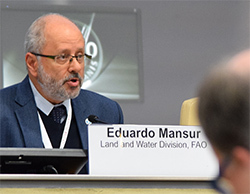 Mr. Eduardo Mansur, Director of the Land and Water Division of FAO, stressed the applicability of the workshop learnings to advance on-the-ground actions in the related fields, noting that “it is important to explore, in a practical way, how we can optimize investments in water, irrigation, and WASH to maximize sustainable development. In particular, we are eager to continue developing common approaches to data collection, project design, monitoring, and evaluation to support countries and better reflect the objectives of the SDGs in all of our operations”. Dr. Sarquis J.B Sarquis, Vice President for Economic Research, Strategy, Partnerships and Chief Risk Officer of NDB, delivered a presentation covering the NDB’s General Strategy 2017 – 2021 and highlighting the massive investment and coordination needs to meet the SDGs. He expressed that “reaching the objectives of the 2030 Agenda will require key actors of global development, including international organizations and development finance institutions, to work closer together in support of countries to achieve their commitments to the SDGs. Therefore, in line with SDG 17, we must continue to build common knowledge and practical approaches to enhance the development effectiveness of our institutions.” Dr. Sarquis stressed that innovative dialogues of this kind can facilitate the alignment efforts among different partners towards the common goals of the SDGs. The workshop initiated a community of practice of that will continue working on the links of investments in the water sector and their contribution to the achievement of SDG 6 and SDG 17.